In Guinea, West Africa, 70% of women give birth at home. The statistic itself may not be shocking, but Guinea’s maternal and child health indicators are among the lowest in the world. Since the 2014-2015 Ebola Virus epidemic that ravaged West Africa, global attention has turned to strengthening the affected countries’ healthcare systems, yet the mistrust and lack of confidence felt by the population cannot be patched by infrastructure alone. The tragic death of Liberian Ebola survivor Salomé Karwah during childbirth highlighted to just what extent the fear of Ebola still affects women’s health; preventing them from accessing life-saving care when they are most at risk. The Health Communication Capacity Collaborative (HC3) is a USAID program for social and behavior change communication. One of the main focuses of this global program was the Ebola emergency response and the post-Ebola recovery among the most severely impacted West African communities. 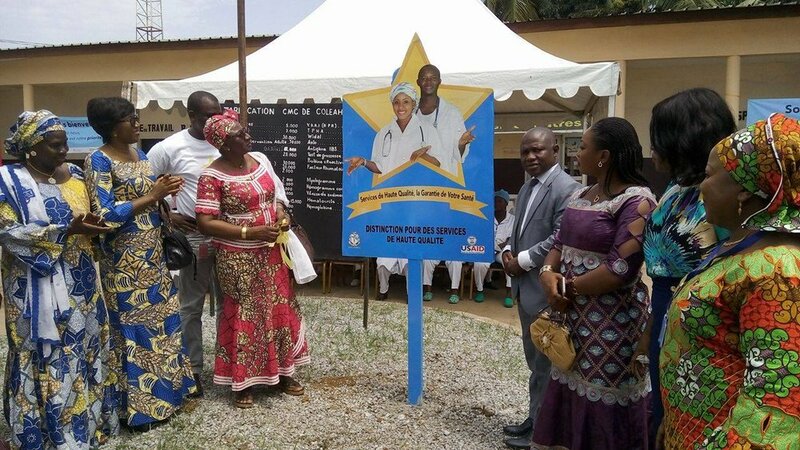 Working closely with Guinea’s Ministry of Health, as well as the Maternal & Child Survival Project (MCSP), the HC3 project launched a rebranding of the healthcare system with the “Gold Star Clinic” logo. Once healthcare facilities met certain criteria, the quality logo would be prominently displayed to inspire trust among the population served and encourage residents to participate in programs and services. HC3 worked in depth with the quality clinics that earned the Gold Star recognition logo to help them promote their services. In early 2017, we developed the “Gold Star Clinics” cloth pattern in close collaboration with the HC3 team in Guinea to generate a more widespread recognition of the Gold Star branded health centers. The team’s goal was to significantly improve maternal, neonatal, and child health outcomes by encouraging women to attend pre- and postnatal care visits and give birth at a Gold Star clinic. The pattern tells the story of a pregnant couple that leaves home to visit their community clinic for prenatal care and delivery. Pathways between homes and clinics symbolize the countrywide network of Gold Star clinics. 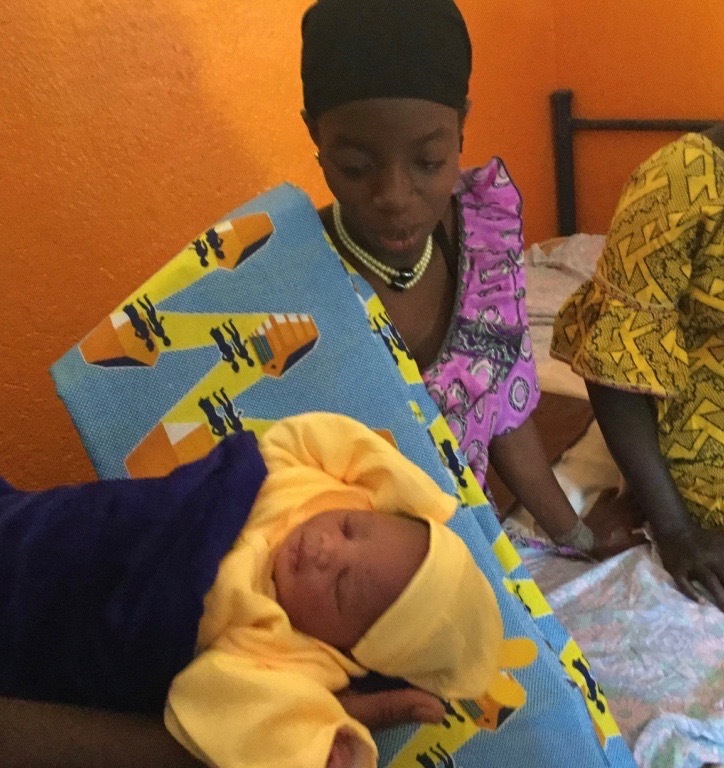 Fabric was given out to 500 women who completed prenatal care visits and gave birth in a maternity ward at one of the Gold Star facilities in Guinea. The program healthcare personnel encouraged the proud and healthy new moms to wear the cloth and share their experiences with friends and neighbors. These femmes phares, or “exemplary women” will be the initial momentum for a wave of change to create a new social norm of using health centers for prenatal and maternity services creating a very important improvement in maternal health.